Synthetic peptide (Mouse) corresponding to 14 amino acids near the middle of mouse TLR7. Ion exchange chromatography purified IgG. Our Abpromise guarantee covers the use of ab24184 in the following tested applications. WB Use a concentration of 0.5 - 2 µg/ml. Predicted molecular weight: 122 kDa. All lanes : Daudi cell lysates. Publishing research using ab24184? Please let us know so that we can cite the reference in this datasheet. Incubation à 4 dégrées overnight. Lyse en utilisant la solution classiques pour TLR3 (TLR endomosal). 3. 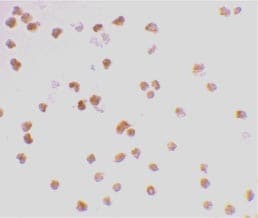 Pour un contrôle positif (car on n'a pas de signal, le contrôle négatifs n'est pas pris en compte), j'ai utilisé les lymphocytes T immortalisé qui expriment ces récepteurs TLR (3, 4, 7, 9). Merci d'avoir pris le temps de remplir notre petitquestionnaire et de nous avoir contactés. Je suis désolé d'apprendre que vous avez eu des difficultés à obtenir de bons résultats avec ab24184. Merci de m'indiquerlarésolution quivous conviendrait le mieux. Thank you for your enquiry. I have been in touch with the source of this antibody to determine how it was tested. I can tell you that this antibody was assayed using a panel of tissues from human, mouse, and rat. Tissue lysates with bands at the appropriate molecular weight were deemed as positive results. A peptide blocking study was also performed with the serum in A20 and Daudi cell lysates. I hope this information helps, please do not hesitate to contact us if you need any more advice or information.